The Eatery, from Massive Health, is a social food tracking app. Rather than focusing specifically on calorie counting, you take a photo of what you’re eating, (optionally) provide a description and then rate how fit or fat you think it is. Overall it’s easy to use, intuitive & nicely designed, though could be a little speedier. Sometimes there’s a bit of a delay between snapping a photo and getting to describe/rate, but it is getting slicker with every update. Adding the ability to retrospectively add meals if you forgot to take a photo has been a most excellent addition for 2012. It helps to combat “all or nothing” thinking: a bad choice is a blip rather than the beginning of a binge. A great improvement on just “good day” vs “bad day” approach many of us default to. 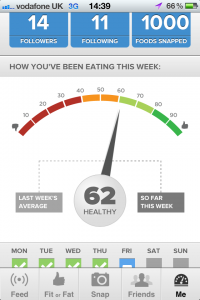 Since it is SO much less laborious (just snap & rate) than detailed calorie counting, it is easier to keep tracking. The community rating aspect is great – gives you a reality check on what you’re eating – and although some folks have some funny ideas about what is (un)healthy, the average tends to be pretty good. Whilst you might argue the opinion of a crowd of strangers is not exactly reliable, I find I object to calorie counting apps for the same reason – since I mainly eat non-prepackaged food, I find it hard to trust the calorie estimates since diff apps vary so much. Some of the little gamification elements help you stay consistent – the quirky “streak” messages from Andrew Carman are particularly awesome. All in all, one of the most helpful health apps I’ve found – and certainly the one I’ve used most consistently for the longest! I really wish they had a version for Android! We’ve gotten multiple requests from users about an Android version, hopefully we’ll get you onboard The Eatery sometime soon. We’ll keep you updated!